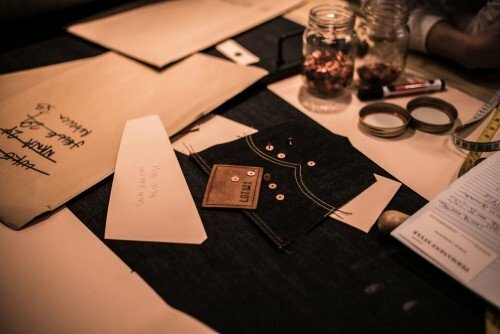 It’s been so long since I experienced bespoke clothing for the first time, or indeed most of the luxury, craft-based things I write about, that I find it interesting when friends do so for the first time. Each finds pleasure, or value, in different things, and their experiences help validate my continuing recommendations – or perhaps reminds me what a newcomer’s priorities should be. I’ve been encouraging one friend, R, to spend more on clothes for a long time. He earns enough money to buy entry-level bespoke, or good Northampton shoes, but never used to. Like many men, he splashed out on travel, technology or food instead. That has gradually changed, and I found it particularly interesting which of my recommendations stuck. R upgraded from £100 shoes to Crockett & Jones, and now to Edward Green. For him, the big surprise was how much pleasure he got out of shoes that look good. The upgrade to Green was largely about aesthetics, but it was worth it. Coupled with this was the fact that shoes actually get better with age, which few other things do. The least successful. Although the first bespoke suit, from Graham Browne, did fit well, R missed the design aspect of branded RTW suits. The fact that the next suit would also fit better was a little off-putting. It’s a lot of money for something that isn’t perfect. For me, this is a binary thing – you either get bitten by the bespoke bug (the choice, the process) or you don’t. A big success. Writing with a good fountain pen after years of biros is huge pleasure – perhaps the most sensual pleasure of any men’s clothing or accessory (only fragrance is close). Like many nice accessories, there’s also a pleasing ritual – filling the pen, putting it away in the desk in the same place at the end of the day. Also a success, and one that surprised me. A 14-inch buffalo shoe horn, it is a lovely thing but without the obvious appeal of other recommendations. It has the same sense of ritual, however – you use it in the morning every day, to put on those shoes you are taking care of, and there are very few men’s accessories you handle so often. R bought raw denim jeans from Albam. As someone who is sceptical about spending money on clothes, something that is physically uncomfortable was not an easy sell. But they’ve gone down very well, due to the way they adapt to the body. Like shoes, they also get better with age. Finally, shirts have never been upgraded. Given last week’s shirt piece, it should be obvious why. There is much less value in bespoke – all you really need is something that fits well. R may try getting a tailor to put darts in his existing shirts. If there is one consistent theme to all this, it is how things age. It’s obviously a theme I’ve covered a lot, but it has an immediate, tactile appeal to men that is also easy to communicate. As always, interested to hear anyone else’s experiences. You can follow the discussion on A newcomer to quality by entering your email address in the box below. You will then receive an email every time a new comment is added. These will also contain a link to a page where you can stop the alerts, and remove all of your related data from the site. Have been wearing Hermes for years, and there is something magical and unique about them. Drakes next, especially their grenadines, but have recently discovered Budd. Keep it a secret. Their grenadines are half the price of Drakes, but every bit as good…………………..
At first reading this I thought I was R ! For example whilst walking around my local city I looked into the Crocketts & Jones shop window and the £300 – £400 shoes didn’t seem expensive. One spends more on car tyres and spends a lot less time in it. Once again I love the focus of this article as it appeals to men across all income brackets. Just one question . You mention “earns enough money to buy entry-level bespoke”. I am not an expert, but I think the answer to the shoe question is quite simple. 400 quid buys you shoes that feel like slippers to wear, look great, and are made to be re-soled and heeled. 100 quid buys you some cemented rubbish that will last a few months then fall to bits. as our friends stateside would say, do the math…………. I love my fountain pen collection, but with the advent of smartphones and tablet computers and really good apps like evernote, I find that I never really write anything anymore. In fact, besides signing cheques, I haven’t picked up a pen to write anything in months….maybe I’ve forgotten how. Very interesting article. I would also propose that the extent to which RTW clothes fit you, is a major factor in determining the success (value?) of the first forays into quality clothing. For me personally, the difference in fit between my first MTM shirts (my “gateway drug” into bespoke) and RTW shirts was so vast that I was instantly hooked. Perhaps if RTW already fits you reasonably well then the difference is less marked and the upside of bespoke will be less apparent? For me my entry into bespoke came over 30 years ago with my wedding suit. Having recently graduated and with Mrs Thatcher wielding her axe, there was no way that I could aspire to Saville Row but Fox & Stanton (now long gone) produced a lovely light weight navy suit that I wore for the next 20 years. Since then I have made infrequent purchases from Timothy Everest and John Pearse (suits and shirts), Jason Amesbury (shoes) and McGregor and Michael for a wonderful wallet in the famous 200 year old reindeer leather used by Cleverley et al for their shoes. One or two disasters – a jacket from Chris Ruocco (North London) that I would literaly not have been seen dead in and a very poor suit from a local tailor for my Cambridge graduation. Shirts – I find Margaret Howell meets my requirements but at £180 per shirt they are not exactly cheap. Pens – I am afraid that I use whatever comes to hand – charity pens etc and it probably shows in my awful hanwriting. Shoe horn – I have a couple of lovely shoe horns and I agree they make the whole process of putting on a good pair of shoes on just that little more pleasurable. Denim – I will soon be 60 and have not worn denim for 10-15 years. I walk to and from work and some days spend time out and about on foot during work so have never ‘invested’ in shoes for day to day use. I agree totally with good shoes and jeans. I also found upgrading from RTW suits to a cheap tailor was a significant improvement since I’m a bit harder to fit. Haven’t tried something as expensive as GB. I’ve also had a big return from adjusting nicer high street shirts and trousers. On the aging theme, I’d add good leather in general to the list – a nice bag, wallet and belt have been great and you get a lot of use out of them.